While in New York City recently, I spent my free time hitting up a few shops. No luck at Jazz Record Center, where I was hoping to find Lucy Reed’s The Singing Reed and keeping an eye out, as always, for John Wallowitch’s album with the Warhol cover. Didn’t fare much better at A1 Record Shop; I thought I’d have a decent chance of scoring Souls of Mischief’s debut LP there, but again no luck. And I completely missed out on catching Savages in-store at Rough Trade at noon on a Wednesday, since I was on the clock. But my favorite shop in NYC, Brooklyn’s Permanent Records, came through as usual. They’ve relocated since my previous visit due to losing their lease; now they’re in a communal upstairs office space instead of a storefront. But their cheap CD bins are still full of stuff I never see anywhere else, and at superb prices. Balmorhea – Stranger. I have their earlier work, but this 2012 release escaped my radar. The Deer Tracks – The Archer Trilogy Pt. 3. Found in Permanent Records’ cheap bins, where I’d previously bought Pts. 1 & 2. Efterklang – Tripper. Their debut, which I’ve never heard. Philip Selway – Weatherhouse. The Radiohead drummer’s second solid solo album. Kathleen Edwards – Voyageur. First contact. Been meaning to listen to her for a long time; it figures that I’d wait until she’s ostensibly retired from music. Ben Folds – Supersunnyspeedgraphic, The LP. Replacing the EPs from iTunes with a higher quality. Agnes Obel – Aventine, Deluxe Edition. Sealed 2014 2-disc reissue for only $10. I’d heard this wonderful album but didn’t own it. The Love Language – Libraries. First contact. Someone recommended this artist to me years ago but I’d never come across one of their albums until now. XTC – Homespun (The Apple Venus Volume One Home Demos). I had the cassette demos that were circulating prior to Apple Venus’s release, but had never picked up the CD version. Sealed, for only $5. Dan Hicks and His Hot Licks – Last Train to Hicksville…The Home of Happy Feet. “That looks old,” Jane said. Yes, it does and is. The only one of the original-lineup, Tommy LiPuma-produced albums that I didn’t have on LP. Cocteau Twins – Treasure. The latest chapter in the continuing saga of repurchasing vinyl I wish I hadn’t sold off in the ’90s. Thankfully the price was reasonable, which is rare for these old CT albums. David Bowie – Lodger. Super-clean ’79 gatefold promo copy for only $12. R.E.M. – Fables of the Reconstruction. The only one of the ’82-’86 releases (the only years of their output that I really care about) that I’d somehow never obtained on LP. 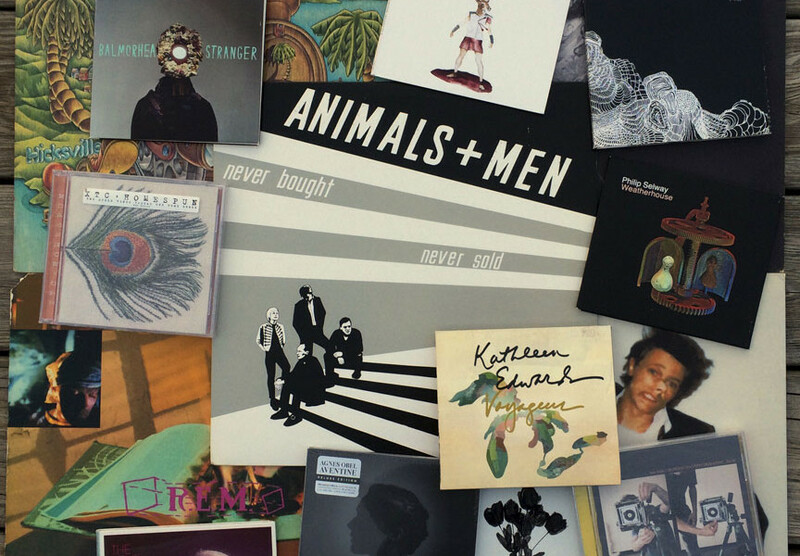 And at the center, Never Bought, Never Sold: Singles + Demos 1979-1983 by Animals + Men. I’ve never heard of this group but they warranted a further look based solely on their name*, which is a song off one of my favorite albums, Adam and the Ants’ Dirk Wears White Sox. And the liner notes of this 2008 compilation (from Portland, OR’s Mississippi Records, which is both a label and a shop) tell me I came to the right place. Turns out they were from Frome, Somerset, UK; while in the scene at the right time (witnessing Joy Division’s first London gig), receiving interest from major labels (who wanted to market them as a cross between the Undertones and Altered Images), and having fans in high places (Adam Ant and Marco Pirroni, at the height of Adam’s career in ’82, were requesting exclusive access to their demos and inviting them to talk about paving the path to stardom), their response to it all was… “Meh”. Much like my anti-establishment musical hero, Martin Newell (aka The Cleaners From Venus), the members of Animals + Men had no interest in moving to London, in tinkering with their sound or image, or in the very nature of the music industry. But whereas Martin kept making brilliant, lo-fi, provincial pop albums from his home in Wivenhoe and self-releasing them to this day, A+M simply walked away. As if I wasn’t already intrigued enough, A+M’s guitarist Ralph Mitchard states in the liner notes, “We had supported Toyah [Wilcox] once and were horrified by her…” And with that, I’m completely won over and really looking forward to listening to this record. Regardless of how I’ll like the music, I know I like the people who made it. And it’s doubtful I’d have ever stumbled across this group without flipping through the racks at a bricks & mortar record store, which is why I love them. *In the course of writing this post, I’ve discovered another group who’s made prominent reference to this same song: The Young Knives, in the title of their 2006 debut album Voices of Animals and Men. It was nominated for the Mercury Prize in 2007 so I’m obviously out of touch for not knowing they existed, but now I’m looking forward to hearing it as well, just based on the knowledge that we love the same thing.